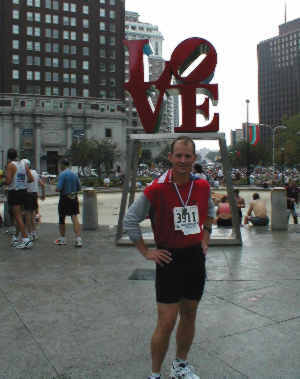 Maybe you’re not too impressed, but I was very happy with my performance in this big time Half-Marathon on Sunday, September 15, 2002. The alarm went off at 5:05 am and I immediately took some vitamins and shaved, just in case a TV camera should pick me out of the 8,500 participants. Then a bowl of Total, some stretching, inserting of contact lenses and the covering of “Paul Bunion” with a pad. 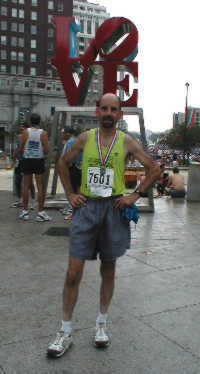 Once I put on the Joints in Motion racing singlet and New Balance shorts and shoes I was ready to take on the Kenyans! The photos on this page were all taken after I completed the run and grabbed a bagel and banana for brunch! 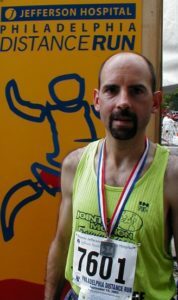 I ran as part of my preparation for the Dublin City Marathon, six weeks later. Half time 1:01:30 – – – Can you do better? Final week of preparations – Some night running on Monday due to arriving home from Queens at 9pm. The 1.75 mile path through my park is lighted, but after completing my first lap, I found out what time the lights go out!!! So I proceeded to hit the road and jog through a nearby development to get in a 45 minute workout. Tuesday was a regular day run and Wednesday’s group practice included some more [mile] intervals. By Thursday, my leg was hurting again, so I took off and made Friday my final run before Sunday’s race. By then I had grown quite concerned about this possibly being a season ending injury! 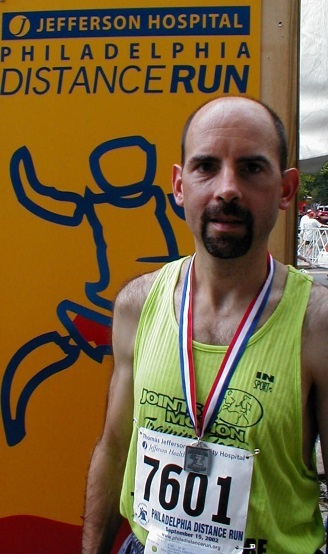 Race Day – I departed my house at 6am and picked up my running partner, Greg Wilson. 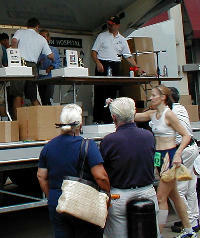 He’s my area manager (Outbound Jewelry) at QVC and hired me there one year ago. 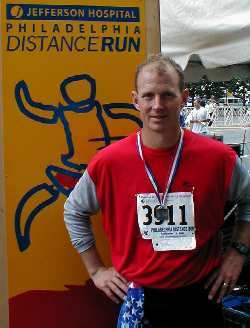 Greg is a former participant in the Boston Marathon and has also competed in several other races. It was a pleasant 30 minute drive to downtown Philadelphia on a foggy, humid morning. The weather called for a chance of showers. We found a good spot in a very convenient parking garage ($19). It was time to pin on my number (7601), take a couple Advil, lace on the ChampionChip (used to track our time during the race) and take a final few gulps of Gatorade. We then walked outside to happily see a row of port-a-potties. 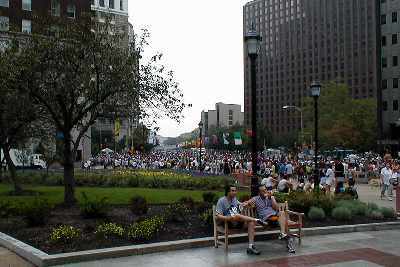 Thousands of Runners – What a scene on Market Street between 9th and 12th! Slim, fit people everywhere, walking, jogging, stretching, hydrating. Music from loudspeakers helped pump us up. In no time I had run into several of my Joints in Motion teammates, including Jill and Scott, who’d be lining up with me in Dublin next month. Greg and I walked around, then jogged for a few blocks to warm up. 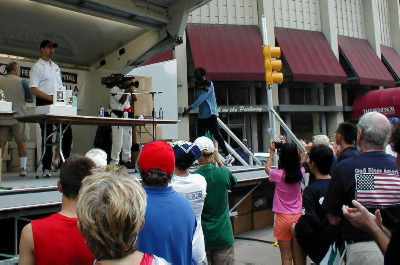 When it neared 8am, the national anthem was sung and the race started. We were approximately halfway from the front of the field and walked for 3 minutes before starting a slow jog at the start line. It was aggravating to start so slowly and we had to take care not to bump into our fellow runners. 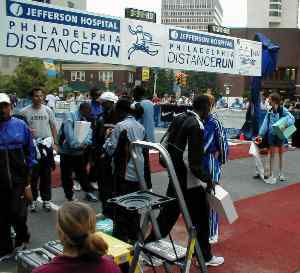 The course started towards the Delaware river where we crossed I-95 to Penn’s Landing, then looped back towards downtown. It became clear that we should have started closer to the front, as we were forced to use the sidewalks to pass slower runners. Avoiding injury was the first obstacle, as I jumped on and off the curb, around parked cars, signposts, and parking meters for several blocks. It was a bummer to see that the first mile took over 10 minutes! No Pitstops – What I really mean is no “Piss Stops”, but that’s a little crass to put in bold type. I could have used one final restroom break, but now that we were moving, I didn’t want to take the time. After 3 miles on the city streets, Greg pulled over for the pitstop, but I continued along. This points out one of my first impressions: Once the race started, we became a mob, ignoring rules and laws… Run through the streets, ignoring traffic signals…..Take a leak anywhere……Throw trash on the ground (when getting cups of water). As the race wore on, I felt that my decision not to pull over to relieve myself was akin to a NASCAR driver trying to stretch out his fuel to avoid a the time involved to fill up. Luckily, it would not prove to be a costly error on my part. 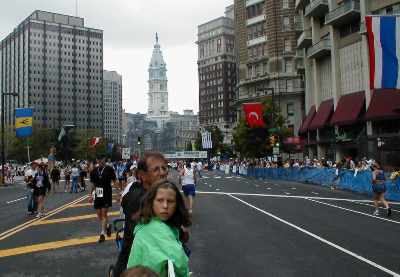 The Schuylkill – The greater part of the race was running alongside the Schuylkill river up on one side, then crossing to the other to return towards downtown. The rumble of running shoes pounding the asphalt provided much of the soundtrack, but here and there, onlookers would call out words of encouragement. 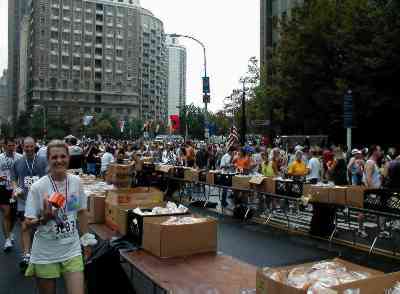 I felt like a true runner upon arrival at the first water station, grabbing a cup while trying to maintain my pace. It was nice to have cool water and Gatorade (lemon-lime) every mile or so. At the turn to cross a bridge to the other side of the river, a drummer was providing some entertainment on one side, while a bagpiper played for us on the other. I was feeling pretty strong at the midpoint (6.5 miles) even though Greg had gone on ahead. I’d catch up to him near the end of the race. Jockeying for position and passing other runners was the biggest game. Home Stretch – It finally started to mist a bit when I was at mile 9, but by then it felt good. 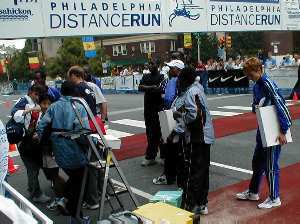 The final two miles were along the Ben Franklin Parkway, a wide boulevard with flags of different nations flying on each side. This is where the majority of the spectators were lined up and the grand sight inspired me to kick pretty well, although that last mile sure seemed long! 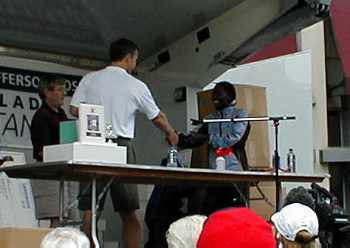 I passed a few more of my competitors in the final yards and through up my arms in victory upon crossing the finish line with an official time of 1:53. 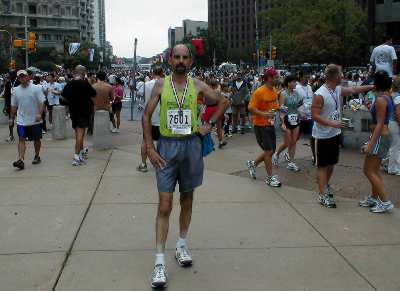 Greg was just twenty yards behind me, which was fairly remarkable, since we hadn’t run together except at the beginning. 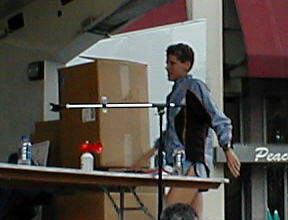 As soon as we were in the chute, we were directed to go to either side to remove our chips and throw them into boxes for the results to be talleyed. 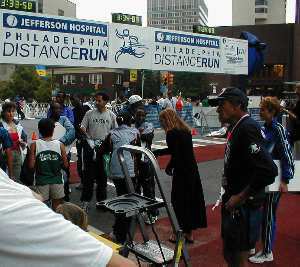 Festive Atmosphere – Thousands of runners were stretching and locating buddies in an area spanning several blocks. I was proud to be part of such a dedicated group of athletes. We were each given a medal for finishing, but the best reward was the food line with bagels, bananas, fruit juices and popsicles. One of the finest Sunday Brunches I can remember! You know I went back for seconds. Cool Down – Some stretching, then Greg and I walked 4 blocks back to our parking garage and found my car after a few wrong turns. I grabbed my camera to take these photos of us and the “elite runners” we competed against. And I am talking elite! 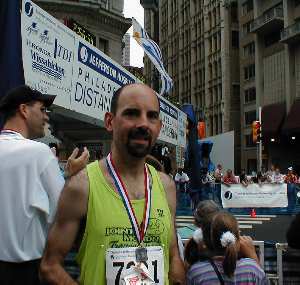 The field included both the male and female current world record holders in the marathon. Home stretch, looking towards finish line.